Doctor William Waldo Rambo was associated with Dr. W. A. Clark and succeeded him in his medical practice following his death. Dr. Rambo was born in Franklin County, Arkansas, July 29, 1893, the son of Dr. Samuel and Lula Crawford Rambo. His father was born in Zanesville, Ohio, April 17, 1853, his mother at Ozark, Arkansas, November 22, 1868. Dr. Samuel Rambo practiced in Ironton, Ohio until 1884 when he moved to Franklin County, Arkansas where he spent the remainder of his life. Dr. Rambo received a Bachelor of Science Degree in 1922 from the University of Arkansas at Fayetteville. He graduated from Washington University School of Medicine in 1926, following which he served four years as house officer of the Barnes Hospital, St. Louis. By appointment of Governor Caulfield he was placed in charge of the hospital of the Missouri State Penitentiary June 15, 1930. According to an article in the Globe-Democrat during his administration of the prison hospital Dr. Rambo “renovated and improved the antiquated building, organized a nurse’s training school with convict enrollment and had the hospital approved by the American College of Surgeons.” He installed…”a kitchen staff, a clerical force, laboratory assistants, and operating room staff, and such orderlies as are required.” For the medical care of this prison population of forty-six hundred a completely modern system of records was installed. In a population of that number, many sick calls are necessary daily and many major and minor operations weekly. Dr. Rambo was an honorary Fellow of the American College of Surgeons, a member of the Cole County Medical Society, the Missouri Medical Association. He was a Rotarian, a Mason, a veteran of World War I and a Democrat. Ed S. Ramsey, born in 1886, spent practically his entire life in Jefferson City. He was the son of George Clinton Ramsey, a native of Franklin County. George Clinton Ramsey married Catherine Hudson Cowley, June 8, 1875. Their children were Mrs. M. R. Armstrong, Mrs. Lillian Gertrude Decker, Joel Frank Ramsey, and Edwin Silver Ramsey. Mrs. George C. Ramsey was born on the Isle of Man, May 31, 1852, her parents coming to Washington, Missouri when she was an infant. 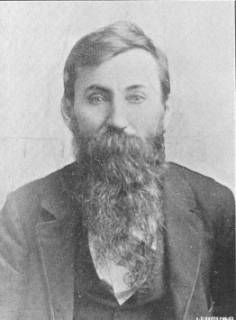 George Clinton Ramsey, born at New Haven, Missouri December 14, 1845, spent his boyhood in Kentucky. On his return to Missouri he lived for a time at New Haven, and at Osage City, but the greater part of his mature life was spent in Jefferson City to which he came in 1886. With his brother he entered the railroad tie business which was later incorporated as Ramsey Tie Company. In his later years he turned over the management of this business to his sons. He died October 5, 1923. Mrs. Ramsey died December 11, 1936. Both Mr. and Ms. Ramsey were active in civic and religious affairs. She was a member of the Presbyterian Church and a charter member and treasurer of the local chapter of the Eastern Star. Mr. Ramsey was a member of the Christian Church and active in Masonic circles. 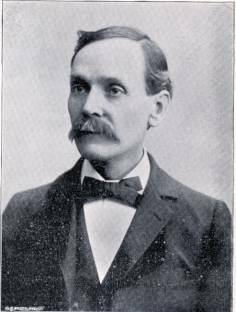 A democrat in politics, in 1896 he differed with the controlling faction of his party on the free silver issue and was chosen delegate to the national convention at Indianapolis to nominate a sound money ticket. Besides his interest in the tie business founded by his father, Ed S. Ramsey engaged in the plumbing business and in the ice and coal business. With the Stone and Webster Engineering Companies, he was right of way man in securing the location of power lines for the Union Electric Company from the Lake of the Ozarks to St. Louis. He was also a local representative of the Anheuser-Busch Company. Ed S. Ramsey married Miss Hilda Porth, daughter of George Porth (see sketch), prominent Jefferson City Jeweler. The wife of George Porth was Helen Meador, of an old family of southern ancestry. Mr. and Mrs. Ramsey had two children, Helen Catherine and Ed. S. Ramsey, Jr. Colonel Charles Means Ray, founder of the Means Ray insurance organization and former mayor of Jefferson City, was born in Cassville, January 23, 1886. His parents were Charles and Jennie Pharis Ray, both natives of Barry County. Charles was the son of Dr. John Ray, a native of Barren County, Kentucky, who moved to Barry County in 1850. He was a surgeon in the Union army during the Civil War. In 1871, Dr. John Ray founded the Cassville Democrat, which he published until his death in 1889. He was a member of the convention in 1875 which drafted Missouri’s constitution. Charles Ray was for a time an engineer on the Frisco Railway. On the death of his father in 1889 Charles Ray succeeded him as editor and publisher of the Democrat which he published until his own death in 1926. Charles Ray served two terms as county treasurer, and was postmaster of Cassville under the Cleveland administration. He married the daughter of D. Patrick Pharis, a pioneer merchant of Cassville, who came to Missouri with his parents in 1831 at the age of two. He was among the adventurers to the California gold fields in 1849. Means Ray, accustomed to newspaper work from boyhood, followed that profession in various towns in several states for two years, then joined his father on the Democrat at Cassville. In 1913 he was appointed chief clerk in the insurance department, where he served four years. He handled publicity for the Democratic state committee for the next two years then became editor of the Capital-News. He resigned this position in 1923 when he established the Means Ray Insurance Agency. Mr. Ray was a colonel on the staffs of Governor Park and Governor Stark. He served two terms as mayor of Jefferson City from 1932 to 1936. June 19, 1912, Mr. Ray was married to Miss Jewette LeCompte of Cassville, daughter of J. w. LeCompte. Mr. and Mrs. Ray had two daughters, Nancy Jane and Sally. James W. Reid, whose ancestors came with Lord Baltimore’s colony the first settlers of Maryland, was born at Edina, Knox County, Missouri on May 23, 1946. At the age of fifteen he enlisted in the Federal army in response to the call for volunteers, and served in the Missouri Division. After two years active service he worked in the Commissary Department. During his active duty he was wounded at Monticello, MO. He was in the battle of Cape Girardeau where General Marmaduke (former Governor) commanded the Southern forces. At the close of the war he engaged in the general merchandise business at Cape Girardeau, the firm being DeCoster & Reid. He sold this business after two years and attended four terms at the St. Francis Seminary at Milwaukee, WI., returning to Missouri where he taught for three years in Saline and Knox counties. He worked as a hardware store clerk for four years for W. J. Fulkerson of Marshall, then went into business for himself, the firm being Reid Brothers. After some years in the hardware business he entered that of real estate and insurance with Thomas Boatright, the firm being Reid & Boatright. He moved to Jefferson City in 1890 and engaged in general merchandising on High Street. While in this business he purchased the Model Steam Laundry, running the same in connection with his store until 1893 when he sold the merchandising business in order to devote his energies to the laundry business. Mr. Reid was united in marriage May 8, 1873, to Miss Bettie, daughter of Michael Schreckler, a prominent farmer of Saline County. Five boys and two girls resulted from this union. The eldest daughter, Vincentia M. married George J. Stampfli, an attorney in Jefferson City. Mr. Reid was a member of the A.O.U.W. and the G.A.R and an active worker in the Democratic Party. 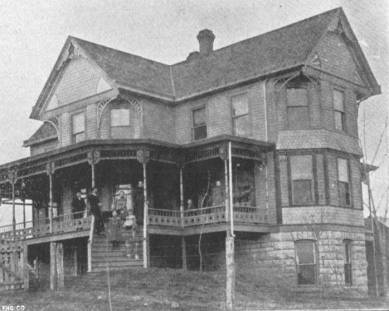 The family resided at 113 West McCarty Street. 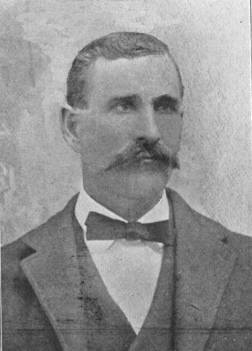 Alfred F. Renn’s father, Jack Renn, came to Jefferson City as a boy in 1867. The father was born in New Albany, Ind. After he came to Jefferson City he was married to Susan Schwaller, who also belonged to one of the old Cole County families. Alfred Renn was born October 27, 1895. He attended St. Peters’ School and the public schools of Jefferson City. He took up the cobbling business as a boy and worked for Nick Powers and later for Burkel and Bosch. Being ambitious he desired to go into business for himself. After a short time as a traveling salesman for the Heyl Packing Co., he established a store in partnership with Mr. Schrimpf on St. Mary’s Boulevard. They operated this store for fourteen years. He dissolved the partnership in 1935 and purchased the stock and fixtures on Clark Avenue. Early in 1938 he established a meat market in connection with the store. Mr. Renn was married in 1915 to Miss Mary Grafe of Meta. They had three children, Lucille, Charles and Josephine. Frank Henry Rephlo was born in Cole County near Taos, December 11, 1842. His father, Bernard Rephlo was a native of Westphalia, Prussia; his mother, Helen Nieters of Hanover, Germany, from which places they immigrated to America in 1837. The father, Bernard Rephlo, was a stone mason and contractor; he helped to build the first Catholic Church at Taos, the material used being logs; the second church which he also assisted to build was of stone and the third (which now stands on the same historic spot) is of brick. From Taos he moved to Wesphalia, Osage County, and while there build the stone church at that place. He was employed on the capitol building erected in Jefferson City in 1838. From Westphalia he came to Jefferson City in 1850, where he opened a general store in a log on the same ground where a substantial brick store and residence was later erected by his son at 501 West Main Street in 1884. 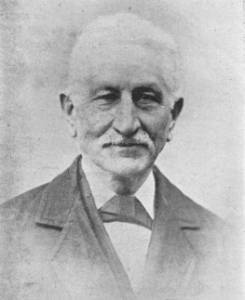 On the death of Bernard Rephlo in 1858, his widow took charge of the business and continued with the assistance of her son, Frank Henry Rephlo. On the death of his mother in 1879, F. H. Rephlo succeeded to the business. November 18, 1876, Frank was united in marriage to Josephine, daughter of Herman Haar, a stone mason and contractor of Jefferson City. Two sons were born to the couple, Joseph H. and Louis S.
Mr. Rephlo, in addition to his large mercantile interests was a stockholder and director in the Merchants’ Bank of Jefferson City, a stockholder and director in the Jefferson City Building and Loan Association, a stockholder in the Bridge and Transit Company and the Jefferson City Brick Company. He also owned a great deal of residential real estate in Jefferson City. He was a member of St. Peters Catholic Church. William R. Rice was born September 15, 1813 near Russellville, Logan County, KY. When he was six years old his family moved to St. Charles County, MO and then to Franklin County. As a young boy, William went to St. Louis where he learned the blacksmith trade with an uncle, John Owens, and with him moved to Springfield, IL where he continued as a blacksmith for several years. He came to Cole County, MO in 1835, first engaging in blacksmithing at Russellville, sixteen miles southwest of the Capital City. He then came to Jefferson City where he had a blacksmith shop at 128 East High Street for a short time before moving to a farm on the Moreau, four miles south, where he conducted a blacksmith shop in connection with his farm. He sold this farm in 1882 and moved to a farm near Jefferson City where he remained until 1899 when he moved to Jefferson City. He was united in marriage in 1838 to Sarah Jane Gordon, and to this union were born ten children. Susan E. (Mrs. Menteer) and Mary F. (Mrs. B. Hampton), both of Jefferson City; Eliza M. (deceased); James A., a hotel keeper in West Plains; Robert B., a carpenter in Jefferson City; Martha A. (Mrs. G. M. Bagby), John T., a miner in Jasper County; George W., a carpenter in Warrensburg; Julia A. (Mrs. T. M. Hampton); and Jefferson D., a blacksmith living in Jefferson City. Mrs. Rice died December 23, 1865 and Mr. Rice died at his home on East McCarty, February 21, 1900. Jacob Lee Ritchie was born on a farm near Prairie Home in Cooper County, June 21, 1864, where he continued until twenty-one years of age when he began farming. He rented a farm near his birthplace for four years, also running a threshing machine and saw mill. He moved to Moniteau County where he purchased a farm which he continued in connection with his saw mill and threshing machine. After four years he sold his interests and moved to Boone County, associating with C.A. Edwards in building a mill at Huntsdale. He sold his interest in this business to his partner about the time the village of Russellville offered him a bonus of about $1,000 and ground if he would establish a good roller mill there. He accepted the offer and built a complete fifty-barrel roller mill. The wheat grown in that area was of exceptionally good quality and its popularity resulted in a demand for increased production capacity. As a result, he formed a partnership with Mr. W.A. Stark and doubled the capacity of the mill. Mr. Ritchie was married July 26, 1885, to Miss Addie Belle Rains of Indiana, whose parents had recently relocated to Cooper County. Seven children were born of this union: sons Porter M. and Roy and daughters Marie, Lizie, Dora, Odie and Nannie. He was a member of the MWA and banker of the Russellville Camp, a member and Elder of the Christian Church. In 1900, Jacob L. Ritchie lived in this house with his wife Addie and their children. His mother-in-law, Henriette Choate was also living with them. Francis William Roer (called William) was born in Jefferson City August 31, 1859. His early education was in the local schools and completed his schooling in Muenster, Germany, graduating in 1874. He returned to Jefferson City and worked for 12 years for H. Bockrath as a grocer’s clerk. He then went into the business of life and fire insurance in partnership with his father under the firm name of Francis Roer & Son. He was city collector one term and served as a member of the city council. He was elected county clerk in 1889 and was subsequently re-elected. He was married June 3, 1891, to Miss Anna A., daughter of Herman Tihen of Jefferson City. Four children were born to this union, Helen Mary, Marie Elizabeth, Sophia Hermine and Francis William Joseph. The family made their home at 220 Madison Street, the home where he was born. Francis Roer was born in Soest, Germany, July 29, 1810 where he worked as a traveling salesman for a wholesale tobacco house and clothing factory. He resigned this position to come to America, settling first in Westphalia, Osage County, MO then moving to Jefferson City in the fall of 1846. In 1850, before a priest was stationed here, he began teaching a Catholic school in his home, which he continued for two years. In 1853 he opened a tannery with Charles Pratt, but because of a lack of shipping facilities, they discontinued the business two years later. Mr. Roer opened a news stand and bookstore, which he operated for nine years, selling to Oscar Monnig. (Oscar was later killed in the disastrous wreck of the first train which went out of the Lebanon Branch road.) In connection with his bookstore and news stand, he engaged in the insurance business, representing four Old Line companies, and in 1860 when the Germania Life Insurance Company was organized he was appointed its first agent, which position he continued until his death December 3, 1888. In 1861 he was appointed Collector by Gen. H. Clay Ewing, at that time Mayor of Jefferson City. He later served the city as Assessor. He was one of the number of men who organized the Catholic Church here and assisted in building the first, second and third church buildings. He was a charter member of St. Peter’s Benevolent and St. John’s Orphan Societies. April 21, 1853, he was united in marriage to Miss Helena Arens. To this union were born three children: Sophia, the wife of Dr. George Schwoerer of St. Louis County; Francis William (see sketch); and Elizabeth. Francis Roer purchased the family home at 218-220 Madison Street in 1867 and after his death his son, Francis William, and his family lived there along with Helena and Elizabeth. Charles B. Ross was born March 24, 1883, in Jefferson City, the son of John N. and Sarah Tuckley Ross. 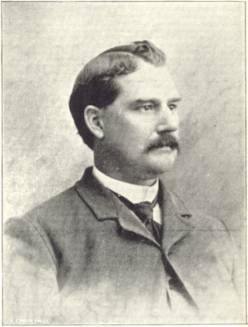 John N. Ross, born on 1842, died September 20, 1920, was a pioneer painter, paper hanger and decorator, working in that business for fifty years. He was the son of William and Nancy Ross. His father died when he was an infant and his mother brought her three children from Jeffersonville, Indiana to Jefferson City in 1843. (See sketch of Henry LePage for further history of the Ross family). John N. Ross married Sarah J. Tuckley October 1, 1868. She was born in Boone County September 2, 1853, and died July 15, 1913. Her parents were Joseph and Jane Tuckley. Joseph Tuckley was born at Northhampton, England, June 27, 1821, and died August 9, 1868. Jane Nixon Tuckley was born in Cheshire, England, June 2, 1822. The Ross home was built by Adam Opal in 1864 and bought by John N. Ross in 1882. Charles B. Ross worked at painting and decorating from the time he was thirteen years old. His services were in frequent demand in the capacity of supervisor by the state and federal governments and much work in the state capitol and other buildings was done under his direction. Mr. Ross was married in October, 1907 to Miss Martha Catherine Smith, daughter of Thomas Jerome and Margaret Frances McDonald Smith. Her father was born in Pennsylvania October 16, 1856 and died in Jefferson City January 6, 1920. He was the son of John K. and Catherine Bryan Smith of Juanita County, Pennsylvania, who were married there in 1847. His wife was the daughter of Mr. and Mrs. Robert McDonald of Irish descent. She died in November, 1935, at the age of seventy-two. Mr. and Mrs. Ross had two sons. Richard Joel, born December 25, 1909, followed his father’s profession. Charles B. Jr., graduated from the state university in the class of 1938 with a degree in business administration. Adam Routszong was born near Frederick City, MD, February 11, 1836 and came to Cole County with his parents in 1840. They settled on a farm near Lohmnan where Adam received his education in the public schools. At the age of 20, Mr. Routszong began working for C.F. Lohman in his store. In 1860 he entered into partnership with A.W. Morrison, then treasurer of the State of Missouri, and opened a store at Morrison in Gasconade County, continuing for one year when he sold out and came back to Cole County. During the Civil War he served with the State Militia. He was unable to join the regular service as he was crippled from boyhood by a white swelling, but did some hard service with the State troops in fighting the bushwhackers and raiders. He served as first sergeant in Company F, 9th Provincial Regiment, enrolled Missouri Militia from July 1, 1863 to November 30, 1863. After securing his discharge, he again went to work for Mr. Lohman and in the winter of 1865 was elected by the House of Representatives to the office of folder. In May 1865 he began merchandising in Cedar City, and in 1866 was appointed postmaster of that community. In 1867 he sold his store and bought a farm near Elston where he remained until the spring of 1892 when he came to Jefferson City. He was appointed Notary Public by Governor Francis and in the fall of 1894 was elected Justice of the Peace of Jefferson Township. He was re-elected in 1898. He was also elected Police Judge in 1897, and continued this office until his death on October 5, 1899. He was buried in the National Cemetery. Mr. Routszong was married in 1867 to Miss Harriet C. Penninger, daughter of William and Elizabeth Penninger of near Wardsville (formerly of Virginia). Six children were born to this union: William Levi, Sarah Elizabeth, John H., Harriet Leona, Susan Ellen and James P. Mr. Routszong was a member of the Presbyterian Church since 1869, and the Grand Army of the Republic. Leslie Rudolph, former warden of the state penitentiary, was born in Cooper County, February 19, 1878. His father was Adam Rudolph, a native of West Virginia. When Adam Rudolph was a small boy his father moved with his family to Cooper County, where he died not long afterward. The three Rudolph brothers became widely known farmers and livestock dealers. Adam was the leader. While neither a politician nor an office seeker, he accepted the Republican nomination for presiding judge of the Cooper County Court, was elected and served four years. He died in 1916, aged sixty-eight. Leslie, the oldest son of Adam and Ada George Rudolph, was born at the parental home near the town of Speed in Cooper County. He lived the usual life of a country boy, doing farm work and chores, and walking two miles to school. November 15, 1896, at the age of eighteen, he married Miss Daisy Hurt. Two years later he bought a farm on credit, and farmed until 1909 when he sold the place and moved to Boonville. The following year he was appointed guard at the state penitentiary under Henry Andrae as warden. Prison guards received at that time seventy-five dollars a month. With the election of Elliot Major as governor, D.C. McClung was made warden, and the prison management being at that time political, he was removed and became night officer on the police force in his home town of Boonville where he served until 1918. In the meantime, under Governor Gardner, a non-political system of management under a board of three commissioners was effected. Under this system Mr. Rudolph was again made prison guard. He served as guard until 1921 when he was made yardmaster. In 1922 he became assistant deputy warden, and was made deputy warden in 1925. In 1926 he was made warden of the state penitentiary, in which capacity he served until February 28, 1933. Upon retirement as warden, Mr. Rudolph engaged in the automobile business in Jefferson City. He and Mrs. Rudolph had one son, Hal, born May 12, 1898. 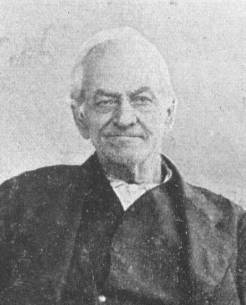 Henry Ruwart was active in the business life of Jefferson City for forty years. He came to this city shortly after the close of the Civil War, in the latter portion of which he served with the Union army. He married Anna Boeckman, who preceded him in death by about four years. Mr. Ruwart was reared in St. Louis and there learned the saddle-tree trade in his youth. On coming to Jefferson City, Mr. Ruwart was employed by the J.S. Sullivan Saddletree Company. Before the development of the automobile and tractor industry, this company was a major manufacturing industry of the city. Mr. Ruwart became a partner in this company within a comparatively short time and remained a partner for about forty years, or until he retired from business some time before his death. Nine children were born to Mr. and Mrs. Henry Ruwart. Jacob H., who married Miss Kate Prenger, died at the age of sixty-three. Henry, Jr., who married Miss Edna Priesmeyer, died at the age of sixty-six, leaving two children. Joseph married Cecilia Meyers and died at the age of fifty-eight leaving two children. One son, George, died at the age of four. Helen became the wife of James Young, son of a prominent Jefferson City physician, Dr. R.E. Young. They had one son, Robert H. Emma married Olga Meals and had two children. William M. married Inez Wilder, daughter of the former state auditor; they had eleven children and he worked as an insurance executive in Pittsburgh, PA. Anna married Hiram Sinclair Miller, son of Frank Miller, former Jefferson City architect. They had three children. Ed A. Ruwart, fifth child of Henry and Anna Ruwart, was born in Jefferson City, September 22, 1879, and reared in this city. In 1912 he was married to Miss Berna Schneider, daughter of Mrs. Anna Schneider of Jefferson City. They had a son. Mr. Ruwart in partnership with his brothers Joe and Will established the Ruwart Manufacturing Company in 1908, producing saddle goods. They learned the business under the direction of their father. The company for a time operated plants in Jefferson City and Denver. The Jefferson City plant ceased production in 1926. For two years after retiring from the manufacturing company Mr. Ruwart was in the insurance business in Baltimore. He later became manager of the Jefferson City Produce Company.